I walked past a sign in a bank window a few weeks ago that said – a return of 0.9% was HUGE – that’s a return of less than 1%. So you put $1000 into a CD and a year later you’ve earned $9 in interest? That’s not huge, that’s a waste of time. It’s probably not a good idea to put your money into a CD that pays less than the rate of inflation. Let’s take a holistic view of the credit markets and where marketplace lending fits in, so we can put in context, a 1% return. If you look at a bank’s loan book, they’ll have three major loan types: consumer loans, business loans and real estate loans. In this video, we’ll look at just the consumer lending segment. Within consumer credit, there’s both secured and unsecured debt. Think of secured debt as having an asset behind it, like a house, that a lender can use as collateral in case the borrower defaults. On the other hand, there’s also unsecured debt. Credit cards are a classic example of unsecured consumer loans – there’s no real asset behind the loan, other than the borrower’s credit score and a promise to pay it back. This is our main focus in marketplace lending: unsecured consumer credit. Marketplace lending has investment opportunities across the risk spectrum, including both prime and subprime borrowers. Here at NSR Invest, we favor lending to more reliable borrowers, those who are more likely to pay back their loans. 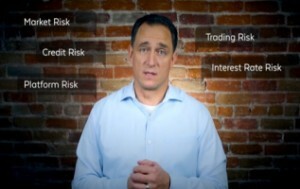 That may sound like an obvious concept, but there are many investors out there that actually target consumers who are more likely to default… Think about all the big bank credit card advertisements you see on TV and fill up your mailbox: They make their money by charging really high interest rates to make up for their losses. This is an irresponsible way to borrow, and invest. Here’s the damage. If someone has a credit card with a balance of $10,000, and it’s charging them interest at 19%, and all they do is make minimum payments, it will take 19.6 years to pay it off! The lender is making out like a bandit, but it hurts real people in the process. Investment strategies like this, tear apart our economic fabric. Marketplace lending does the opposite. With marketplace lending, we are investing in installment loans, which are a healthier alternative to revolving credit and credit card debt. Borrowers pay off their loans in equal monthly installments over a specified period of time – say 3 to 5 years. Each payment they make involves a payment of interest and a healthy chunk of principal, so the whole loan can be paid off quickly. 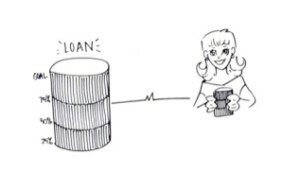 Both revolving loans and Installment loans have a long history in the US. At this point, US consumers have over $1 trillion of credit card debt. That’s bad. Americans are overextended. The good news is that since the inception of marketplace lending, over $10 billion of installment loans have been issued to Americans, allowing them to pay off their credit cards and borrow responsibly. And here’s the amazing thing, with marketplace lending, you, the individual investor, get to participate by providing healthy loans – and you get paid to do it! Remember the 1% return I saw in the bank window? You can either put your money in that CD and make 1% and do absolutely nothing for the fabric of our economy, or you can participate in marketplace lending, earn a really solid return – I’m talking about a return of 5%, 7%, or even higher – and make an impact!